THE SUPER RICH PHILANTHROPIST - ARE THEY DIFFERENT THAN PREVIOUS GENERATIONS OF WEALTHY GIVERS? There’s a new kid on the fundraising block - the Super Rich Philanthropist. And no pun intended, some of these heavy givers are young. They can be mainly found in the tech industry, with some in other sectors - real estate, finance, energy and retail. A few of them achieved billionaire status at an age when many would have still been finishing an undergraduate degree or entering the workforce for the first time - Facebook’s Mark Zuckerberg was 23, Amazon Founder Jeff Bezos even younger at 22; others were slower off the mark taking until their 30s or later (source: Business Insider When richest people in the world became millionaires/billionaires). So, what’s different about them, if anything? David Callahan, author of The Givers: Wealth, Power and Philanthropy in a New Gilded Age (a fascinating read by the way), and editor of Inside Philanthropy, says that’s a good question and not easily answered (The Givers. Inside Philanthropy). “That’s because today’s new donors are quite heterogeneous in their backgrounds, thinking and approaches. Yes, some of the top new donors are young billionaire types from the tech industry, but plenty of others hail from sectors like real estate, energy and retail. 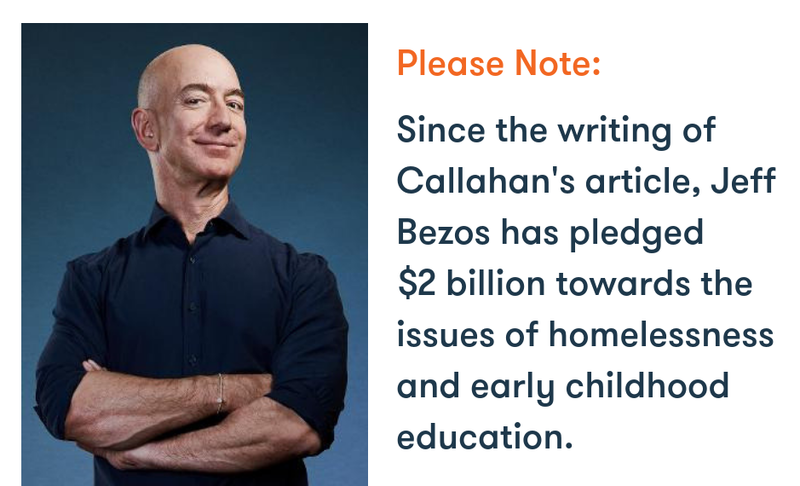 Over two dozen members of The Giving Pledge [The Giving Pledge is a commitment by the world's wealthiest individuals and families to dedicate the majority of their wealth to giving back] are from finance. Most of the pledgers are older, which is true of leading philanthropists — and the super-wealthy — overall. The average age of billionaires on the Forbes 400 list is 65, and for all the talk of early giving, large-scale philanthropy still tends to happen late in life, as business leaders turn from making fortunes to disposing of them. In any case, today’s new crop of donors hardly invented the ethos of ‘change, not charity.’ Two of the founders of modern philanthropy, John D. Rockefeller and Andrew Carnegie, had huge ambitions to remake key systems in U.S. society. Rockefeller sought to bring about sweeping changes in public health and medicine, as well as education in the South. Carnegie aimed to modernize the teaching profession and, even more grandiosely, dreamed of ending the scourge of war. He also brought public libraries to scale as a key institution in local communities. Julius Rosenwald’s vast effort to build schools for blacks stands on par with today’s charter school movement. Olivia Sage, Edward Filene and Robert Brookings aimed to harness social science research to public policy in new ways. The list could go on. The biggest shift in the past 20 years is that the prime movers in philanthropy are no longer legacy foundations, as was true during the second half of the 20th century. When I first started paying close attention to philanthropy in the mid-1990s, it was a world dominated by endowed institutions created by industrialists who had long ago passed from the scene. Today, the most important players in philanthropy are living donors. That’s not to say that legacy foundations don’t remain hugely influential and, in plenty of cases, quite creative and dynamic (despite what you might hear from dismissive tech types like Sean Parker). But their importance in relative terms has steadily diminished, as new mega-givers have arrived on the scene. In a growing array of fields — such as K-12 education, scientific research, criminal justice reform and environmental conservation — money from living donors plays a dominant role. This shift is likely to accelerate in coming years. And while it’s true that the hard-charging living donors of today are often similar to mega-givers from earlier times, they do tend to operate differently from legacy foundations — taking more risks, placing bigger bets, and moving with more urgency. (Although, again, it’s important not over-generalize on this score.) And even if the majority of newer donors do give mainly to established causes, the ranks of those philanthropists who are instead focused on systemic change has lately exploded. Disruptive philanthropy may be over a century old, but it’s now practiced on a scale never seen before in U.S. society. “…a cliché that springs to mind about philanthropy today is that it’s ‘the same, but different.’ The most ambitious and creative of the new donors aren’t any more ambitious or creative than Rockefeller, Carnegie and Rosenewald. But there are many more such mega-givers operating in a more sophisticated environment that’s been enriched by a century of learning. And their arrival on the scene in recent years marks a big break from the golden age of institutional philanthropy in the 20th century. In our work at ViTreo, we have seen the nonprofit sector in the U.S. and Canada become progressively more top-heavy, resulting in a great deal of philanthropic leverage held by a small group of wealthy individuals and foundations. While this trend provides opportunities, it comes with its challenges which I will explore in this series on the Super Rich Philanthropist - stay tuned. DO YOU SEE THIS PHENOMENON AS FAVOURABLE? OR ARE YOU CONCERNED ABOUT IT — OR BOTH? In the U.S., the report, Gilded Giving 2018: Top-Heavy Philanthropy and Its Risks to the Independent Sector (36 pages, PDF), found that “the charitable sector is changing from a sector with broad-based support contributed by a wide range of donors to one dominated by a relative handful of individuals at the top of the income and wealth ladder. In 2017, for example, households with income of at least $200,000 accounted for 52 percent of all charitable deductions, compared with 30 percent in the early 2000s. Similarly, the percentage of charitable deductions from households with more than $1 million in income grew from 12 percent in 1995 to 30 percent in 2015. According to the report, the share of all households giving to charity fell from 66 percent in 2000 to 55 percent in 2014, while over the same period the number of low-dollar and mid-level donors — who traditionally have made up the vast majority of charities' supporters — fell by about 2 percent annually. A steady growth of the private foundation sector in Canada, with more families and donors interested in committing to institutional philanthropy. I also wrote about this influential group of philanthropists in an earlier blog, The Emerging School of Philanthropists, if you’re interested in learning more about how they give and for recommendations on how to approach them. Have you also noticed a decrease in giving by low to mid-level donors? And an increase at the level of high net worth individuals? Some of that may be attributable to the downturn in the economy. The American economy is stronger, the Canadian economy stable, however, there is still a widening gap between those who have and those who don’t. Although it’s wonderful to see the enormous gifts being donated, there are risks attached. Our role as fundraising professionals is to guide others to do philanthropy well; to ensure donations of all sizes have an impact. WHAT CAN WE EXPECT TO DISRUPT THE FUNDRAISING SECTOR IN 2019?